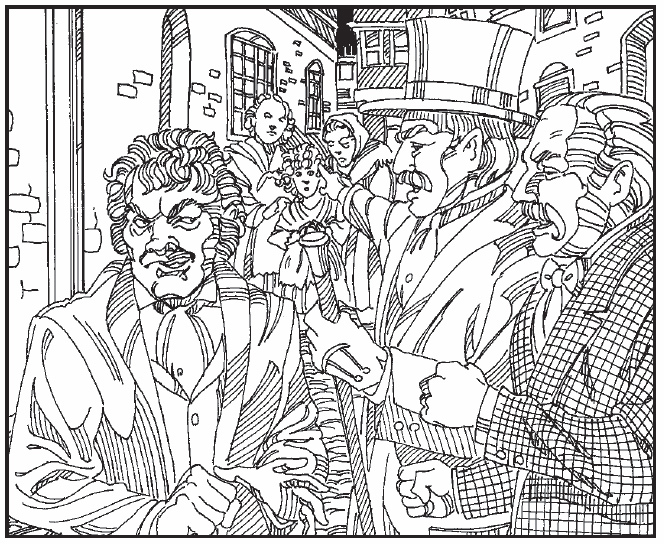 I have here some of the illustrations from Dr. the book Jekyll and Mr. Hyde (Saddleback Classics) by Janice Greene. The creators of all of the artwork in this book are only listed as "Black Eagle Productions". I think it's a pity that there aren't any specific artists or designers mentioned for these illustrations. While I find the cover art to be a bit odd - I mean, that face that (I assume Hyde) is pulling is really derpy - I really enjoyed the art inside the book itself, as little as there is. The aspects I really like about the internal illustrations are their cleanness (something I really appreciate after seeing some really sloppy artwork in other J&H books), the composition of the scenes, the use of hatching and texture and the level of detail in both the figures and the backgrounds. 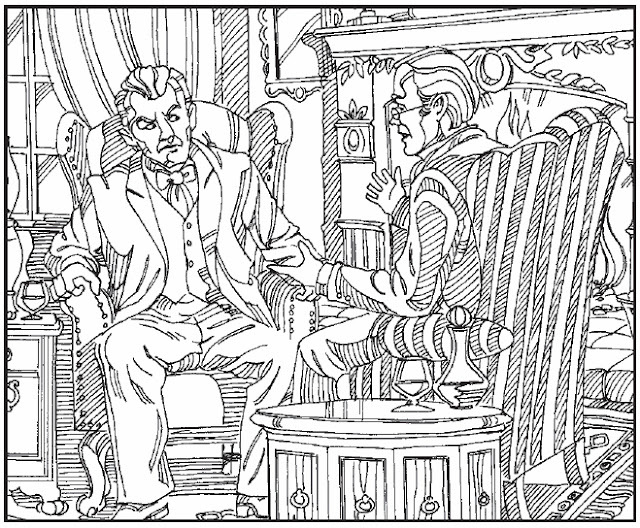 I also really like how much its style makes me think of that of coloring books, since I think it would be fun to have one about Jekyll & Hyde. Since I don't know about the existence of any, these pictures make for a great substitute. 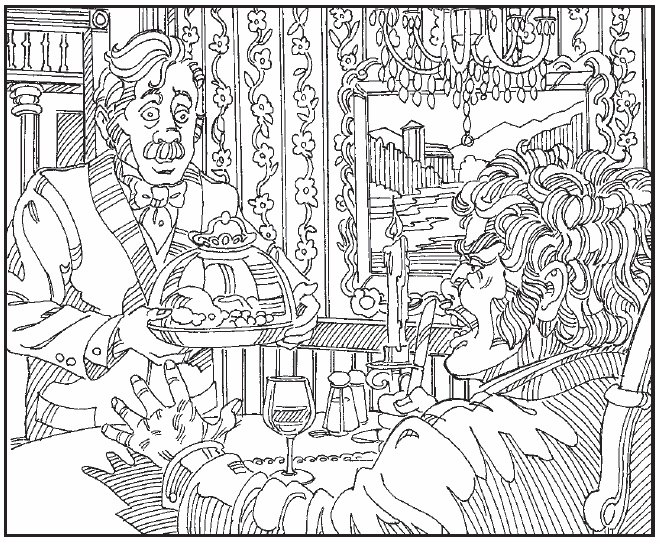 As for problems with them, I personally could do with more variation in line width and contrast, since I often find it hard to focus my eye on any one part of a picture when everything in it is white or very light gray. And in pictures with no coloring and the barest minimum of shading like these, there is very little that works to distinguish background from foreground or lines that define shapes from those that add detail or texture. 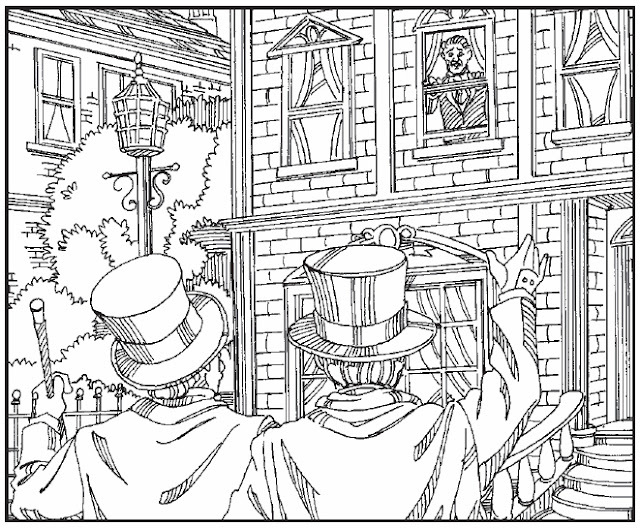 It would have been helpful if the lines' width and quality were somehow used to make these distinctions clearer. 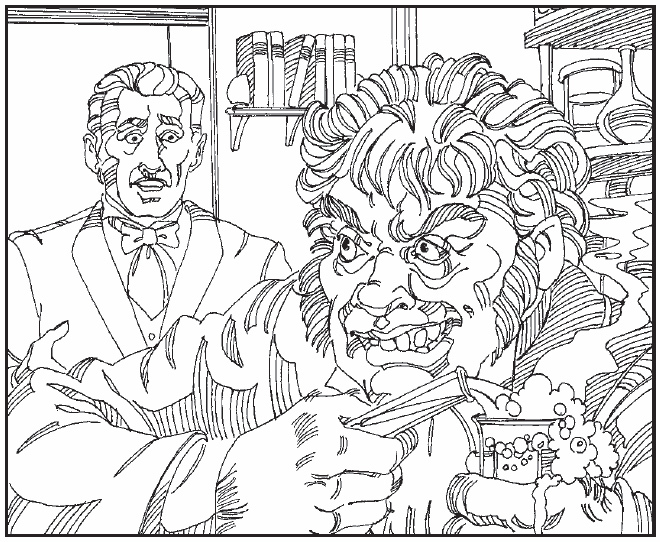 Otherwise, my only other complaint is that more scenes weren't illustrated. 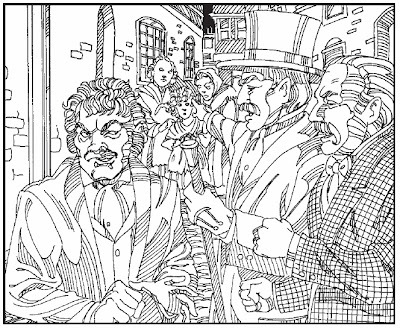 The artists seem to have decided to stick to mostly scenes involving Utterson's investigation. While I am all for sticking true to the themes and story from the original novella, I really wish they had decided to cover some of the more dramatic, exciting, and really iconic scenes, and left out some of the less exciting ones. 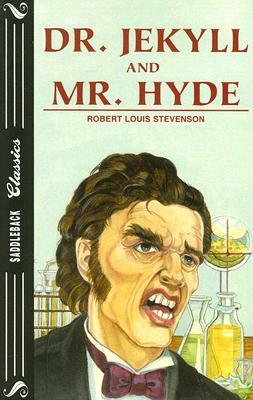 For instance, not replace the illustration of Hyde having a meal brought to him by Poole with Jekyll working, or Hyde's death, or Utterson with the axe breaking into the laboratory? 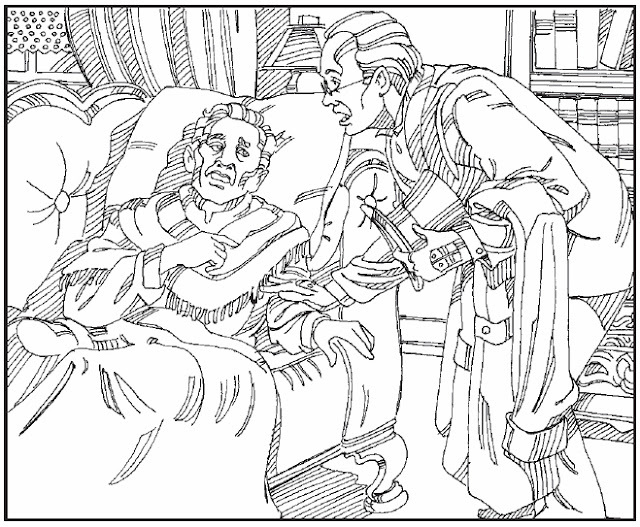 I mean, what J&H illustrated book doesn't include some depiction of Jekyll taking the potion and transforming into Hyde? That's one of the scenes that people always think of when they think of this story. I really would have liked to see what kind of illustration they'd make for it. 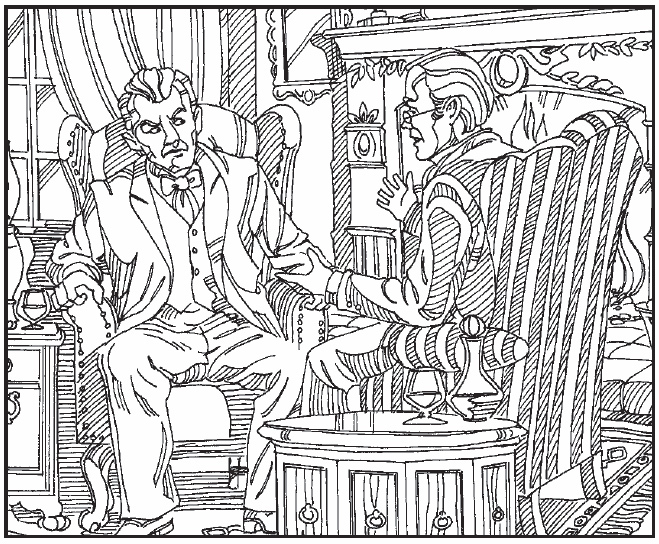 Well, enough with my commentary - here are the rest of the illustrations!